The beauty of taking advantage of new input types is that if someone’s on an antiquated browser (any version of IE–kidding of course), then the input field will default back to type=”text”. These new input types are especially useful on mobile devices, by informing the mobile OS to serve up the most appropriate keyboard for the task whenever someone taps on a field asking for a telephone, email or web address. Here’s a reference of all the fields I’m going to cover. 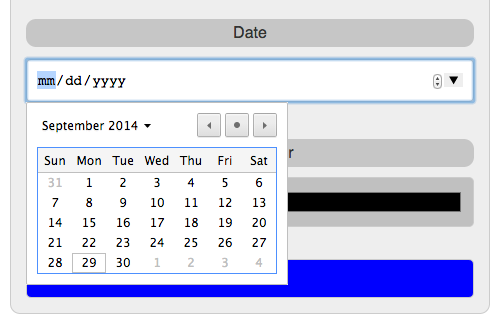 See the Pen HTML5 Form by Richard (@barkins) on CodePen. If you have ever constructed a database driven website, you’ll know how frustrating it is whenever someone enters information into the database inconsistently. These new input types help in producing more consistent results from user submitted information. Not only are you able to easily set the input field to required just by adding the word, required, but as an email type, the field will automatically check to see if the user entered the email account correctly. In effort to make forms less cumbersome to the user, you’re able to now add a list of possible values a user may enter, expediting the process of filling out a form. 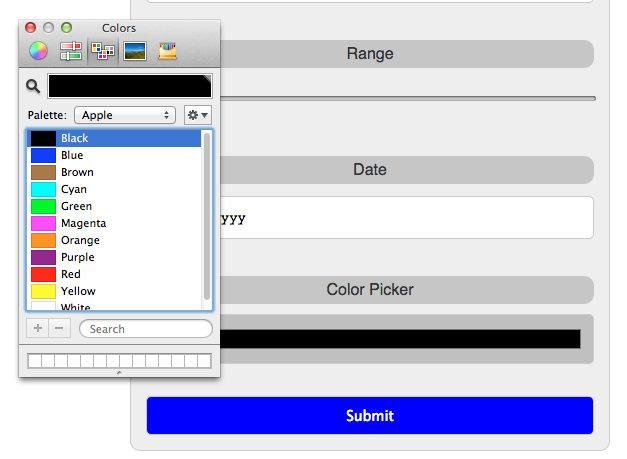 In the following example, I created a list of colors a user may enter. As they type their favorite color, a suggestion of possible options appear. Here’s how to construct a list of suggestions. And here’s the input field referencing the list of options. The range input is also very useful in cases when you want to store consistent and specific information in the database without running into a risk of a user entering something by mistake. The color picker, just like the calendar picker is also very useful, but alas from my experience doesn’t have the same support on smartphones that it does on the desktop.